Fuel cost, dwindling resources, and exponentially increasing traffic density have brought about a sea change in thinking of automotive designers, manufacturers, and end users. Though number of recently developed advanced high-strength steels fulfill the expectation of automobile component manufacturers in terms of weight reduction and safety norms, it suffers the inherent problem of spring back phenomena and limited formability. This problem can be addressed if the component is formed at high temperature where it has adequate formability and subsequently it is controlled cooled to get the desired combination of strength and ductility; the process is commonly known as hot stamping. 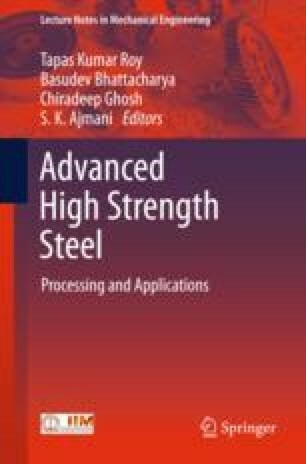 As C (0.2–0.3 wt%)- Mn (1.2–1.3%)- Cr (0.1–0.2 wt%)- B (25–35 ppm) alloyed steels have been the point of focus for the choice of materials in hot stamping, study has been carried out on effect of concurrent deformation and cooling on hardening behavior and associated microstructural changes of C–Mn–Cr–B steel. Further, effect of molybdenum (~0.1 wt%) in influencing the microstructure and thereby hardening in conventional C–Mn–Cr–B steels has also been evaluated. The present study reveals that a range of tailored properties can be achieved through locally controlling strain, strain rate, cooling rate, and resultant microstructure within the stamping die. The authors acknowledge help and support provided by RDCIS, SAIL, Ranchi.